Eliot residents, the community, along with the support of a community organization, and members of St. Philip the Deacon Church have teamed up to grow food at the church, located at 120 NE Knott Street. Plans are underway for diversified community participation with gardening plots for African Americans, church members, houseless, disabled, veterans, community, and youth. The gardening members are asking the community and Eliot neighbors to donate gardening materials and supplies. They are also inviting folks to volunteer any of their time to building garden beds, helping with the garden set up, and gardening maintenance for this activity project. Let’s pitch in and feed the community! For more information contact the coordinator, Shireen Hasan: shihas_2005@yahoo.com. PLEASE NOTE: THIS MEETING HAS BEEN POSTPONED UNTIL THE END OF APRIL. Check back for updated information. At the Healthcare Design Expo & Conference in Phoenix, Arizona, November 12, representatives of Legacy Health and landscape architect Quatrefoil, Inc., received The Center for Health Design’s Evidence-Based Design Touchstone Award Platinum – the highest level – for the Evidence-Based Design (EBD) and Evaluation of the second-floor terrace garden at Legacy Emanuel Medical Center. 1) MudBone Grown LLC farms, an African-American run farm growing food for the community, is located at 7900 NE 33rd Dr., in Portland. Volunteers of all ages are encouraged to participate. Children, elders, youth, and families can help with planting and general farming for the next upcoming season working with Shantae Johnson and Arthur Shavers – the king and queen of this operation. Contact the Oregon Food Bank email volunteer@oregonfoodbank.org to sign up. Visit http://www.mudbonegrown.com. The City of Portland Bureau of Environmental Services has nearly completed upsizing and repairing sewer pipe on Rodney Avenue between Sacramento and San Rafael streets, and on Sacramento, Thompson, Tillamook, and San Rafael streets between Rodney Avenue and Martin Luther King Jr. Boulevard. In January, February, and March crews will focus on mainline sewer construction east of Martin Luther King Boulevard between Brazee and Thompson Streets. Night work will be required to connect the new sewer to manholes in Martin Luther King Jr. Boulevard. To view the most current map that shows where crews will be working, go to http://www.portlandoregon.gov/bes/eliot. Hey Eliot friends! I’m one of the owners of Breadwinner Cycles and Café on Williams at Page St (one block south of Russell). We have been making custom bicycles for many years, and about a year ago opened a cafe adjacent to our shop. I’m reaching out to just let you all know that we are here. We’re not in the thick of the busy retail part of Williams and we have parking, making it a convenient place to stop, but also easy to miss. Our menu has breakfast and lunch items, coffee and espresso from Water Ave, and beer and wine, all with a view of our little bike “factory.” We’d love to have more neighborhood friends stop by, whether you are into bikes or not, so please think of us next time you are looking for a treat close by. Thanks! Gary Sansom doesn’t have to go far to visit a museum. 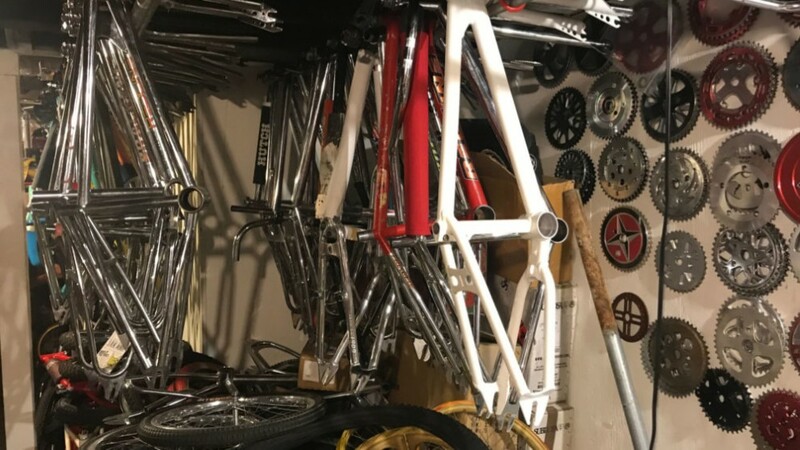 He has one of the world’s largest collections of BMX bikes in his house. There are bikes in the kitchen and bikes in the dining room – which really isn’t a dining room at all, just a room in the middle of the house with custom shelving units built to display different bike parts from different eras.